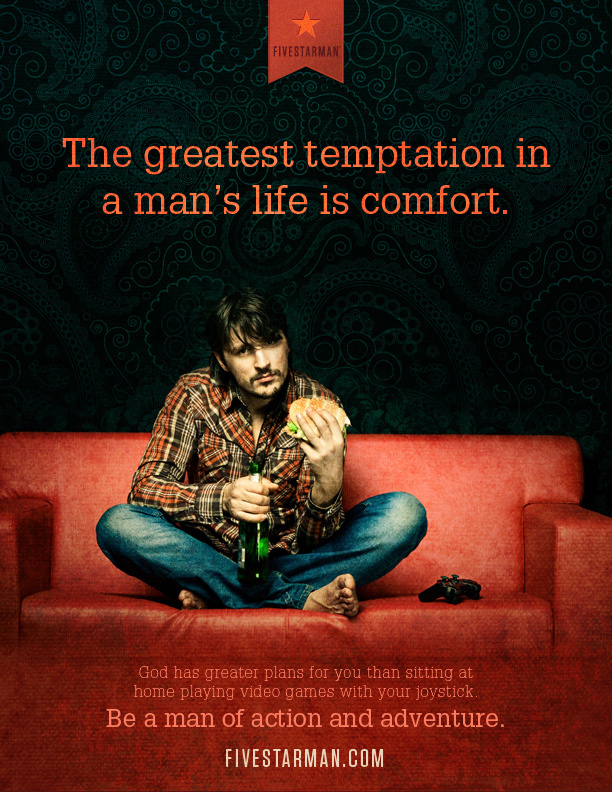 The greatest temptation in a man’s life is comfort. home playing video games with your joystick. Video games are a modern day reference, but the temptation of embracing a life of ease and comfort while forgoing a life of action and adventure is an age old story. Consider the story of Abram. Abram stepped out of his father’s household and ventured into unknown territory simply because he heard the voice of God say to him, “Go to the land I will show you.” It takes a bold and adventurous young man to leave the comforts of home to wander in the wilderness. As a result of his action and sense of adventure, Abram was blessed beyond measure. His enterprises grew to such a large scale that he employed hundreds of men. By all accounts, Abram had it made. He could have kicked back and enjoyed a life of comfort and ease. But Abram had developed an incredible skill to lead men. Not only did he teach his men a trade, he taught them to fight as well, for he knew the time would come when others would come to steal what he had built. When Abram heard that his nephew had been taken prisoner, he lined up his servants, all of them born in his household—there were 318 of them—and chased after the captors all the way to Dan. Abram’s retaliation against the marauders was quick and decisive. When his nephew, Lot, was captured, Abram sprung into action and rallied his men—318 of them—to go after and rescue his nephew. He organized his men into small groups groups and attacked guerilla-style, invading the enemy by night. He retrieved Lot and all the women, children, and possessions that were stolen and then plundered those who initiated the raid. That’s a strong and decisive man of action. As men, we need to be prepared for action. We may not have to train our employees to be men of war, but we certainly should train ourselves to be aggressive and strong when it comes to doing what’s right. We need to be eager to respond, not delaying, not pausing, but ready and willing to move to action. What are you preparing for? Are you conditioned for action? Are you training your employees to be ready for action? If the conditions for you or your company were to suddenly change and immediate action was needed to take hold of new business, are you ready? Men of action and adventure are prepared. Are You a Man or an Ostrich?